What it says in the title. I finished these just before the computer died and so couldn't post them. These come as a pack of eight, with shields but no weapons. The website shows four pose options, but the pack was rather a disappointment in that I got four of the same pose! Since that sort of uniformity looks so wrong in a rabble like this it was out with saw, scalpel and greenstuff to change arm positions, hair and add a hood to one. I added hand weapons as well, a mix of swords (home cast scabbards fixed in place and embellished with greenstuff), axes (ex-Gripping Beast) and daggers (sculpted in situ with greenstuff). The javelins are brass wire hammered and ground to shape (the pack doesn't include spears), and the shields are a mix of the large Crusader examples from the pack plus spares of various shapes and sizes taken from Black Tree, Newline and Gripping Beast figures undergoing restoration. I'm not unhappy with the end result. Well, here they are. 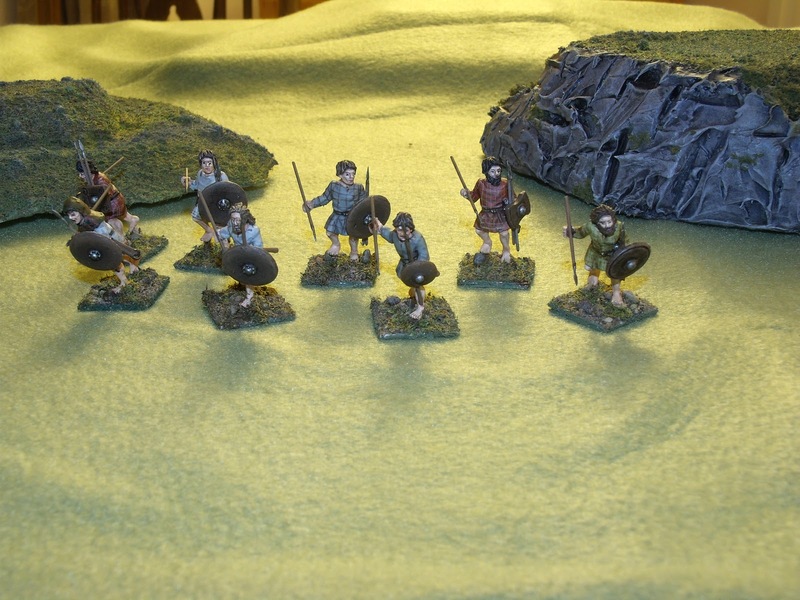 The first unit of my Pictish army to take to the table.